This year's Leonid meteor shower peaks during the pre-dawn hours of Saturday, November 17th, and it's shaping up to be a beautiful night for stargazing. 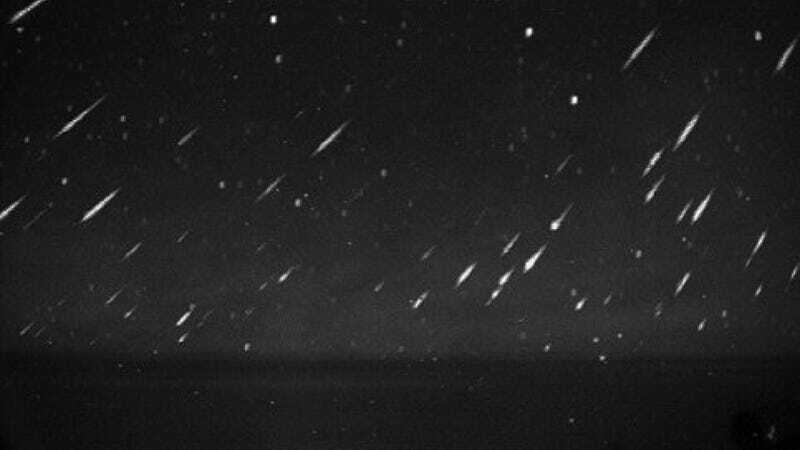 According to NASA, tonight's shower could be one of the best Leonid displays in years. Here's everything you need to know to spot as many meteors as possible. Mike Brown (the astronomer who killed Pluto) likes to say that the Moon is his nemesis, because it washes out his view of celestial bodies in the night sky. And while you may not agree with Pluto's demotion, you'd be wise to take Brown's dictum to heart; when you're looking for meteors, the Moon is your enemy. Fortunately, the lunar phase tonight is a waxing crescent (just a few days past-new), so moonlight should be at a minimum. But city lights, street lights, house lights, flashlights, any lights can be just as bad. Your surroundings will be giving off tons of the stuff, as will your personal items — so don't blow your vision by checking your indiglo watch out of habit and for god's sake don't look at your phone. Taking all these things into account can make a huge difference. The images featured here help illustrate the effect that light pollution can have on your stargazing experience. The bottom photo was taken in Orem, Utah — a major metropolitan area with around 400,000 people. The top photo was taken in Leamington, a rural Utah town, about 75 miles southwest of Orem, with a population of just 217 people. The difference in visibility is staggering. Give it a little forethought, and you can vastly improve your experience; the Clear Sky Chart website has a great list of optimal viewing locations organized by state, so go check it out. Once you're all settled in at your prime viewing spot, give your eyes at least 20 minutes to fully adapt to the dark. How do you know if your eyes have adapted? A good rule of thumb says if you can see all the stars in the little dipper (you should count 10) you'll see plenty of meteors. If you can't spot all 10 it's not a big deal, that's just under optimal conditions. The best hours for catching the Leonids will be between midnight and dawn on the morning of Saturday, November 17th, with activity peaking between 3:00 and 5:00 ET. You can also use NASA's Fluxtimator to help calculate the ideal time to direct your gaze skyward. The Fluxtimator even takes your viewing location (i.e. whether you're observing from the city or the countryside) and the brightness of the Moon into account — just be sure to adjust date and location information accordingly. Bear in mind, however, that meteors' trails tend to be shorter the closer they are to the radiant. Your best bet is to probably just look straight up, keeping in mind that meteors can appear anywhere in the sky. If you'd like to join local experts, click here to find your neighborhood astronomy club, and find out whether they'll be setting up a telescope you can peek through with friends. Bring a reclining lawn chair, a blanket, some pillows and a coat, as it's likely to get chilly. Basically, bring whatever you need to get comfortable and still keep your eyes on the sky. Don't try to stand. Standing and looking up may seem like a decent enough idea, but eventually your neck will get tired, and the second you take your eyes off the sky is invariably when the brightest meteors of the night will go blazing by — it's like a code that all meteors live by. You shouldn't really need a telescope or binoculars, because you'll want to keep your eyes on as much of the night sky as possible. Bring something to snack on, but nothing you have to look at to eat. Hot chocolate is always nice. And finally, bring some good company, so you have somebody to "ooh" and "ahh" with while stargazing on this beautiful autumn night. Last little tip: should you find yourself in Asia tonight, you have the chance to witness an absolutely ridiculous natural light show. According to Bill Cooke of NASA's Meteoroid Environment Office, experts are "predicting 20-30 meteors per hour over the Americas." Not bad. But they're predicting "as many as 200-300 per hour over Asia." Yeah.